As we all know Teenage Mutant Ninja Turtles love pizza and they are willing to do anything to get another tasty piece. 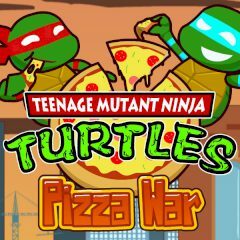 Lead two characters and collect all pizza slices, dodging the obstacles and killing enemies. Teenage Mutant Ninja Turtles are ready for your next mission, however, they need to eat something first. Yet, it's impossible to order pizza at that time, so they need to find it themselves. Explore the city and collect as many pizza slices as you can, dealing with city scums and other obstacles on your way.